TAUNTON, Mass. – With a spot in the history books on the line Friday night in Taunton, the Needham boys' basketball delivered. Behind stellar shooting from junior Thomas Shaughnessy and senior Matthew Shaker, the third-seeded Rockets defeated top-seed Mansfield, 65-56, and captured the program's first ever sectional title. Needham (20-4) will now await the winner of Saturday's Division 1 North final between Cambridge and Central Catholic, and will next play Tuesday night at the TD Garden in the state semifinals. “The whole town is behind us and everybody is coming out and supporting us,” said Shaughnessy, who finished with a game-high 26 points to lead his team. Shaughnessy and the Rockets fed off the emotion of the crowd all night. The team as a whole connected on 11 three-pointers, and Shaker himself scored 18 of his 20 points from behind the arc. Defensive-minded Mansfield (23-3), though, was able to find some of its best offense of the season in order to keep pace with the high-octane Rockets who, from the opening tip, were flying up and down the court. Trailing by 5 entering the second quarter, following a Shaughnessy half court buzzer-beater, the Hornets came firing back. Senior Max Boen began to find room inside the paint to get to the rim while junior John McCoy (11 points) came off from the bench and added a spark for the Hornets with 9 first half points that led the team entering the break. Mansfield senior Philip Vigeant converted an old-fashioned 3-point play that gave the Hornets the lead, 33-32, going into halftime. During that quarter, Mansfield also locked down on defense, holding Rockets star shooter, Shaughnessy, to only 1 point. The third quarter continued the trend from the quarter, before it set as a back-and-forth game, as neither team was willing to give an inch on the big stage. But whenever their seems to be a big stage, it is the 6-foot-1 Shaughnessy standing in the spotlight. A three-pointer from Shaughnessy in the final minute of the third quarter extended the Rockets' lead, 49-44, and they took that advantage entering the fourth. Shaker on the quarter's opening possession started it with a bang for Needham – nailing a deep three from the top of the key. This shot was then answered by Mansfield junior Tyler Boulter (10 points). Another three-pointer by Shaker was matched once again by the Hornets, this time by Vigeant (12 points), and the Rockets weren't able to pull away easily. That was until Shaughnessy again stepped up. Out of a timeout he gathered himself in the corner, and with two defenders closing down on him, found just enough space to get a shot off and connect on the three. That gave the Rockets a 58-52 lead with just under three minutes to play. Senior Christian Weber for Mansfield was able to get a midrange jumper to fall on the Hornets' next possession, trimming the lead back to four. But four free throws from Shaughnessy and two from Shaker, along with a massive black from junior Michael Klemm, sealed the deal, and the Needham student section stormed the court as the final horn sounded. 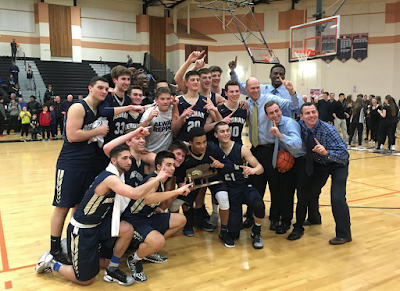 “We told the kids game by game 'we want another day in the gym together,' and that has been our message: earn everything.” said Needham coach Paul Liner. “It is a great feeling and obviously a dream we have had. This is a special team. A really special team.